Mollner Dentistry is pleased to offer 2 locations for your convenience. All doctors rotate through both locations, so you may see your favorite doctor at either location. Please refer to the schedule below to find the doctor’s schedule for each office. Our Capitol Hill office is located near downtown Denver, 4 blocks south of the Capitol Building. 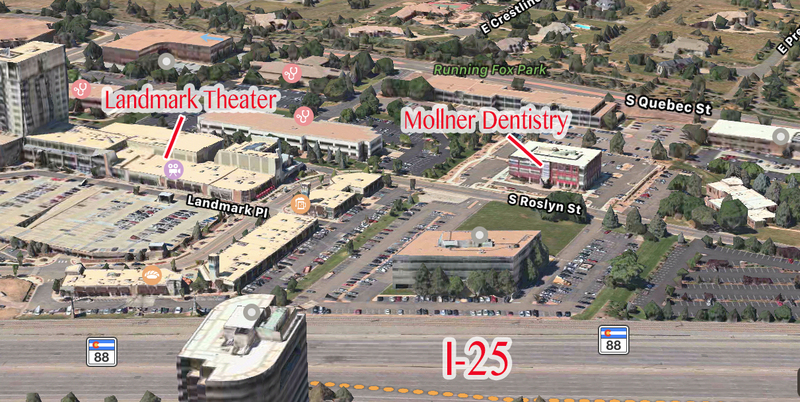 Our Greenwood Village office is located in a new medical office building adjacent to the Landmark Theater and Shops. Parking: Free parking is available in the North Garage. The Beauvallon has two garage entrances on Lincoln St. and the North entrance will take you to our parking. Proceed up the ramp to the second level. You will pass the Matrix Fitness Center door inside the garage and on the other end of the second level you will see our entrance and parking.